Low play through requirements on all Ignition Casino bonuses. Valuable promotions for players at all bankroll levels. Expensive to withdraw if not using Bitcoin. Our review of Ignition Casino only focuses on the casino element of the online gambling opportunities offered by the site and the casino promotions available to players. This is because there are so many opportunities and promotions available for casino players, it would be confusing to start listing other non-casino features at the site. For example, visitors to Ignition Casino will notice that the site is advertising a $2,000 first deposit bonus. The deposit is divided between a $1,000 Ignition Casino bonus and a $1,000 Ignition Poker bonus. As better first deposit online poker bonuses are available elsewhere, we suggest that players also only focus on the casino element of Ignition. 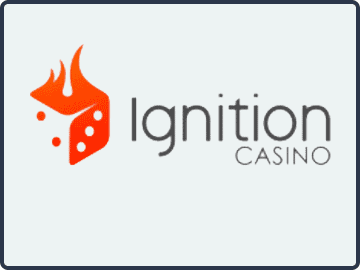 A second casino bonus of $2,000 is also advertised on the Ignition Casino Home Page. This bonus is a 200% bonus on the dollar value of first deposits made using Bitcoin, up to a maximum bonus amount of $2,000. As you will see throughout this Ignition Casino review, the site strongly encourages Bitcoin transactions – going so far as to make fiat currency transactions unviable. Ignition was launched in early 2016 specifically as a U.S. facing online casino. Having a web-based platform powered by Rival and Realtime Game software, no download is necessary to play at Ignition Casino. Players with mobile devices will also be able to access the full suite of casino games via Ignition´s mobile site. Ignition is very much focused on Bitcoin, and offers more valuable casino bonuses for players who deposit with the virtual currency. Depositing and withdrawing via Bitcoin is free of charge at Ignition Casino, and the site also guarantees Bitcoin payouts within fifteen minutes after approval – whereas alternative withdrawal methods can be expensive and take up to week. The Ignition Casino bonus is a 100% match on first deposits up to $1,000 – unless you fund your account with Bitcoin, in which case the site is offering a 200% match on first deposits up to $2,000 and 25% Bitcoin reload bonuses thereafter. For players using conventional funding methods, Ignition Casino offers a daily 100% reload bonus up to $100 in its “Weekly Boost” promotion. Slots and specialty games (Keno, Scratch Cards, Bingo, etc.) contribute 100% to the play-through requirement. Video poker and table games (except those listed below) contribute 60% to the play-through requirement. Games of Baccarat, Blackjack, Craps, Roulette and Sic Bo do not contribute at all to the play-through requirement. Ignition Casino has an easy-to-navigate lobby offering players an excellent selection of games. The most populated area of the site is the slots menu, and a helpful filter helps players to select from five-reel, three-reel, progressive and 3D games. Each game also has a detailed explanation on how to play it and its features. The other areas of the site that can be accessed from the main lobby are table games, video poker and specialty games. Again, each section has a helpful filter to direct players to each type of game with a full explanation available about how each game is played. At the time of writing this Ignition Casino review, there are more than 180 games from which to choose in total. Bitcoin: no fees at all! Withdrawals can be made by Bitcoin, Rapid Transfer, Visa, or check by courier. Except for players requesting payouts by Bitcoin, Ignition Casino allows one free withdrawal every four months. Once the free withdrawal has been used, the site charges between $50.00 (Rapid Transfer) and $75.00 (Visa or check) per withdrawal. Ignition Casino is a collaboration between several existing online casino operators. So, despite only being launched in early 2016, the site has an experienced and efficient customer service department that can be reached 24/7 by telephone or online contact form. The Ignition Casino website also has an extensive Help section that includes a comprehensive guide to Bitcoin. In addition to its first deposit and daily reload bonuses, Ignition Casino hosts quite a decent eight-tier Rewards Program. Every time a player $1.00 on slots or $4.00 on other games at the online casino, they receive a Reward Point. Points accumulate through the month, determining which tier of the Rewards Program a player achieves and what offers they are entitled to. The Rewards include free casino chips, enhanced deposit bonuses, cashback, and draw tickets with $3,000 in cash prizes up for grabs each week. Participation in the Ignition Rewards Program is automatic, and progress in the program can be monitored through the “My Bonuses” section of the player´s account. Players start receiving Rewards as soon as they have earned their first ten Reward Points. Our “likes” and dislikes” are based on our time playing at Ignition Casino. Because different players have different motives for gambling online, not everybody will agree with our conclusions, but we feel it is important to point out the following. The generous and achievable Ignition Casino bonuses are structured so that players do not have to deposit more than they can comfortably afford to lose. The excellent selection of games is easy-to-navigate and fun to play on the site´s top class software. The Ignition Rewards program gives players with a modest bankroll the chance to win cash prizes in the weekly draw or aim for more lucrative rewards. There are no opportunities to test the games out in “play mode” before playing for real money. The fees for depositing and withdrawing (other than with Bitcoin) are unjustifiably high. Although transparent, there are a lot of terms and conditions to read through. It is not often that a conclusion to a casino review is so easy to write. Basically avoid Ignition Casino unless you are comfortable using Bitcoin. The fees for depositing and withdrawing using conventional funding methods diminish the value of the Ignition Casino bonuses and Rewards Program to such as extent that a winning player could end up losing money. If you are comfortable with Bitcoin, Ignition Casino offers a vast gaming arena with superb opportunities to enjoy a lucrative online experience. We would suggest that players have an understanding of each game before wagering real money and employ a system of bankroll management to avoid the temptation of chasing higher statuses in the Ignition Casino Rewards program.